African Footprint is a drumming and dance group. A cooperative project between Ghana and Denmark, it was established to give performance opportunities to people with special needs who are otherwise marginalized by Ghanaian society. 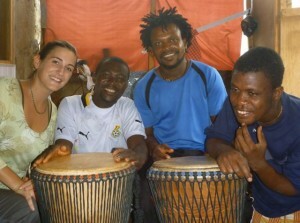 There are many performers based in Cape Coast and even more in Denmark. I became involved with the group, taking drumming lessons through them and working with teachers at a school that the organization had built. Since February, I have been taking lessons on the djembe. Almost every day, I have been going to the seaside community of Ekon to meet my teacher. He is an excellent drummer, and he always has some crazy new rhythm for me. It has been a challenge trying to keep up with him, but for a total beginner I have been holding my own! Yesterday was my final lesson, as my teacher will be leaving soon for a summer program in Copenhagen. I am sad to be finished; I was actually becoming pretty decent! I will definitely be keeping in touch with him, we have been discussing the possibility of collaborating on a project (of course I would be playing sax instead of djembe.) In the meantime, I would love to be able to take some drumming lessons while I am in London!